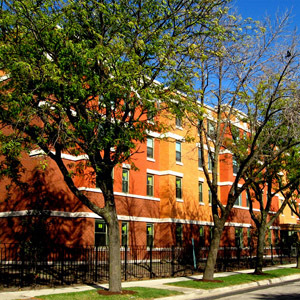 Coppin A.M.E. Church and Interfaith Housing Development Corporation created a partnership to develop two 27-unit apartment buildings in the Washington Park neighborhood of Chicago. 24 one-bedroom units are designed for singles that have income of less than 50% of the area median income. Thirty of the units are either two-, three-, or four bedroom units targeted to low income kinship families consisting of adults raising children of close family members.